Finally, this will be the last post for my Japan Winter Trip in 2015. I’ve got other countries whose highlights I wanna review, but for Japan, I just have to review everything. Day by day. For the WHOLE WEEK! Surprisingly, on our last day in Tokyo, the temperature got a bit warmer (11 degrees Celcius) and I felt like it was such a good day to walk around the city. 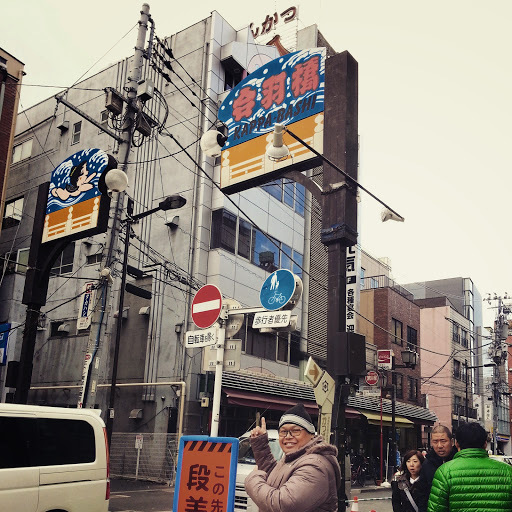 We started in our hostel’s area first, Asakusa. 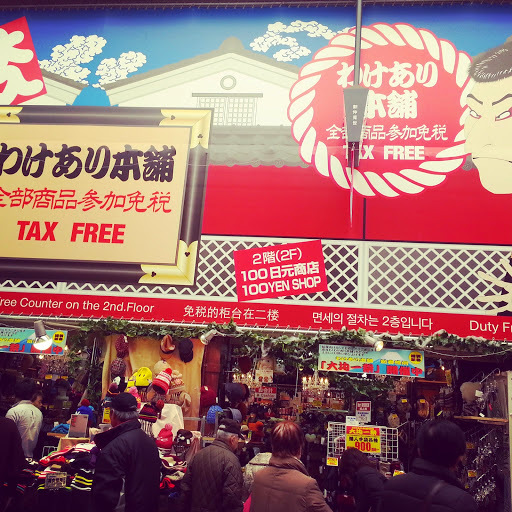 100YEN SHOP is very popular in Japan for you who’s looking for affordable souvenirs! Seems to be a second-hand comic books here. Although we previously planned to buy some souvenirs from Asakusa, we finally left the area as we were entering another area called Kappabashi. 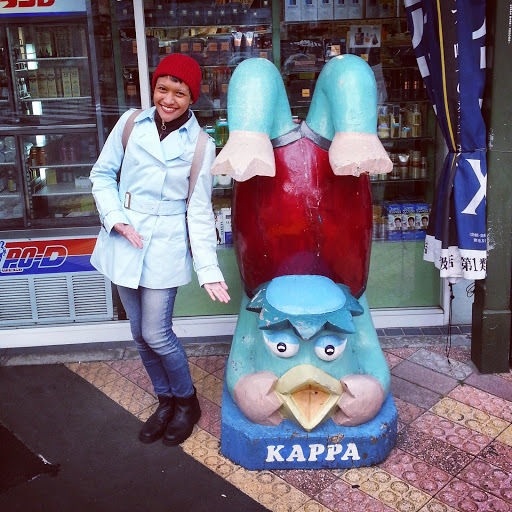 With Kappa, a mythical creature from Japanese folklore. 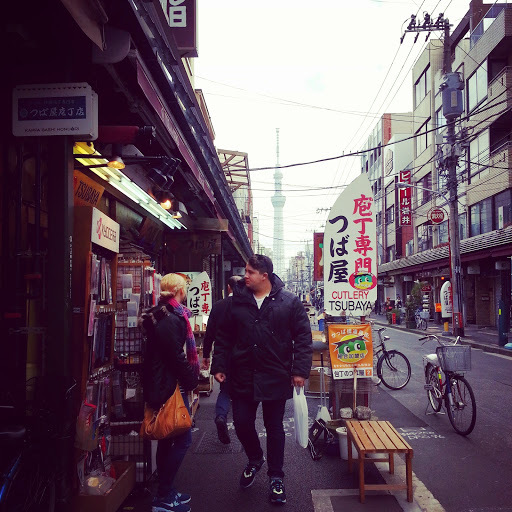 Kappabashi itself is also known as Kitchen Town. 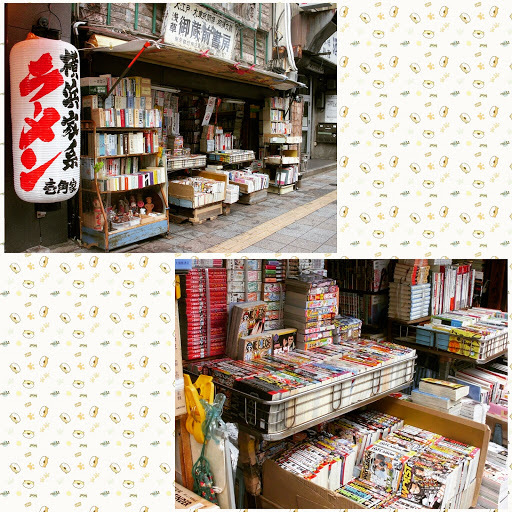 From its name, we know that this area is popular for anything related to kitchen stuff, from selling kitchen utensils to plastic display food that you may find a lot in front of every restaurant in Japan. All those plastic food items were made so so good that you might think it’s real food. They also have plastic food as fridge magnets and key rings! As I am dating a chef right here, spending sufficient time in Kappabashi was like a guarantee. Jutet was super excited to look for knives here. If you don’t know, Japanese knives are the best in the world. They have all the types to cut everything… maybe even to cut human body. Just kidding. In front of one very well-known Japanese knife shop: Cutlery Tsubaya. Jutet said that the quality of the knives here is just exceptional. Some knives cost 300,000 JPY, or even more. Equal to paying 2 more winter trips like this, haha! Well, but it’s true what they say though, YOU GET WHAT YOU PAY FOR. Deciding to skip Kappabashi as well for any purchase, we then went to Asakusa Don Quijote, an interesting department store that is open 24/7 and sells normal to weird stuff. Let me show you what’s normal and what’s not, in my opinion! 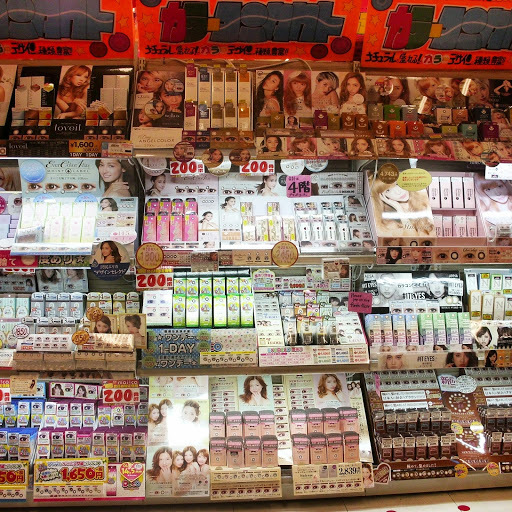 Japanese affordable and cute cosmetic products. Normal. Costumes and wigs, specially made for Japanese ladyboys. NOT NORMAL! Don’t get me wrong. I’m totally fine with ladyboys. As I’m living in Thailand for the moment, it has become so normal for me to see ladyboys everywhere here. I’m just saying that it’s not normal cause I have just never seen any department store in Indonesia selling costumes which are specially made for ladyboys. 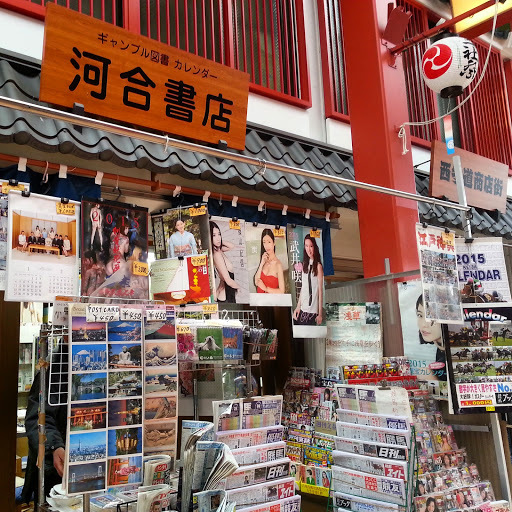 Plus, Japan is not a place where you can easily spot a ladyboy, so it’s actually amazing to find such thing. We bought some Japanese snacks like the green tea Kit Kat and Pocky here, and returned to our hostel, preparing to check out. We felt so sad, knowing that we had to leave soon. One week in Japan was just not enough. No, not at all. So we checked-out from the hostel and took a train to Haneda International Airport. As mentioned in my first Japan winter trip post, we took Philippine Airlines to fly back to Bali. Philippine Airlines is a full-board airline, and is the flag carrier of the Philippines, just like Garuda Indonesia for Indonesia. So I was amazed that they had such a good rate for the flight from Tokyo to Bali (transit in Manila). Of course we chose this one then. Cheaper than AirAsia, and we didn’t have to pay more for the food and the baggage. Awesome! Arriving at Haneda International Airport, we found a shop selling Kit Kat with so many weird flavors, the ones that we did not find in Don Quijote or in any other shop we visited in Tokyo! There were flavors of strawberry cheesecake, rum raisin, red bean, and even wasabi! In Don Quijote, we only found the flavors of green tea, strawberry, and dark chocolate. Still normal, haha. Unfortunately we didn’t have enough cash left to buy the other Kit Kat flavors. Well, we had some, but the Kit Kat was sold in big packages, and they cost quite a lot, so we finally just finished the remaining cash to buy some fridge magnets. No complaint, please. I collect fridge magnets, and I’m crazy of them. 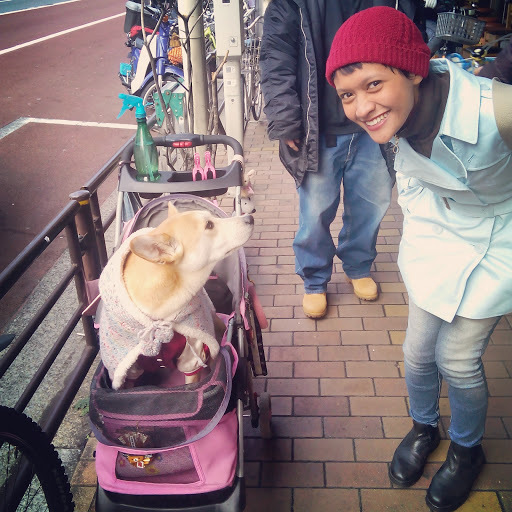 I guess it’s the end of my series of Japan Winter Trip 2015 blog posts. 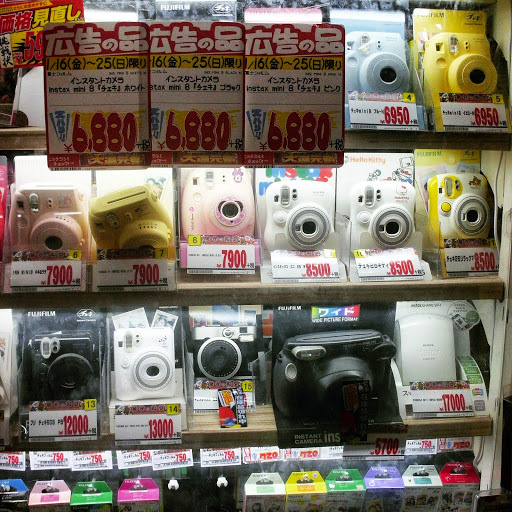 There was not much to tell about the last day as it was merely a day for souvenir/snack-hunting. We did not do much in Ninoy Aquino International Airport in Manila either, just sitting around at the assigned gate area, waiting to get on board for our flight to Bali. There was one thing I’d like to tell you, though, before ending this post. The feeling of stepping outside Ngurah Rai International Airport in Bali, that night when we arrived back, was not a really nice one. Why? Not because we were not happy to be back home, but because it was 29 degrees Celcius in Bali… After spending a week in winter, we felt like it was 45 Celcius degrees or something! Goodbye, Japan! You were definitely the best country I’ve ever visited so far. I’m looking forward to be back there soon. Next time, I’m not gonna miss Hokkaido! Bustling Tokyo, Here We Go! Thank you for your kind comment. I'm glad that you enjoyed reading my blog. I have just checked yours, too. Keep on writing, Greek Alien Queen!